We saw the first Rock Wallabies from quite far in Ormiston Gorge. They bounced along the rocks enjoying themselves not caring for the difficult ground. 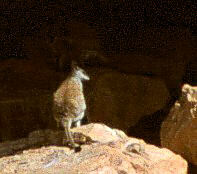 We were delighted, not guessing few hours later we would get pretty close to some of them in Standley Chasm. 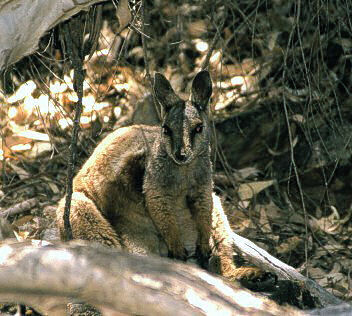 The first wallaby sitting beneath a cycadee and we were happy, not even guessing it would become even better. 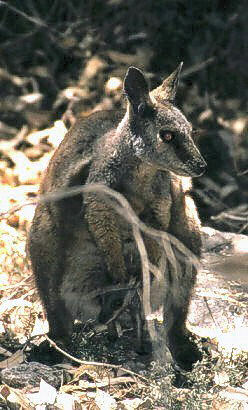 This wallaby mum was very friendly. She was absolutely happy to see about 3 people within a distance of some 3 metres in a crescent around her. 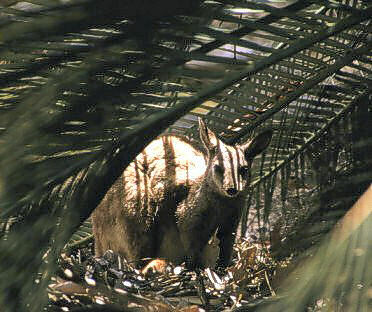 Remaining relaxed, she nibbled some herbs, showed off her child and sat down to observe us. It really seemed we were welcome entertainment. We were so close we didn't need to get any closer for better pictures.